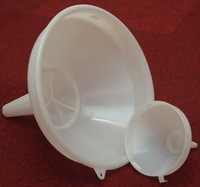 A super size, 13.5" (35cm approx) diameter heavy duty plastic funnel complete with integrated straining disk. This 13.5" (35cm approx) diameter funnel is manufactured from heavy duty food grade plastic and comes complete with an integrated straining disk. It can be used for many jobs in home beer and wine making. It is huge and large enough to sit across the rim of 25 litre buckets and 25ltr wine fermenter to make it easy to strain fairly large volumes of pulp from fruit wines. It will not work with our standard 15ltr Youngs buckets, which have the same diameter rim as the 25ltr buckets, because the funnel at an overall height of approximately 32cm (approximately 27cm to the shoulder) is deeper than the bucket, nor will the spout fit into the neck of a standard 25mm diameter demijohn. The smaller funnel in the picture is actually our standard 15cm diameter funnel and is there purely for comparison purposes and is not included with this item.